From Maryland to Maine, millions of Americans were digging out and doing damage control Thursday after a blustery nor'easter dumped more than 2 feet of gloppy snow across the Northeast. More than a half-million utility customers were waiting for the power to come back on. Hundreds of flights were grounded as airports emerging from the foul weather-induced paralysis struggled to clear runways so planes could land and depart. In snow-blitzed New Jersey towns like Westfield and Montclair, the buzz of chainsaws was the soundtrack for the day as municipal workers cut hundreds of toppled trees down to size and cleared them off damaged houses, downed power lines and clogged roads. The nasty nor'easter was also deadly: In Franklin Lakes, New Jersey, a man was burned to death when he drove over a downed wire in his SUV, and in Suffern, New York, an 88-year-old woman was killed by a falling tree, police said. It was a daunting déjà vu for many across the Interstate 95 corridor, which was hit last Friday by a deadly nor'easter — one that cut the lights to more than 2 million customers from Virginia to Maine. This time, it was Massachusetts that had the dubious distinction of having the most residents in the dark, with electricity cut to more than 230,000 customers as of Thursday night. New Jersey was next, with about 140,000 customers still without juice, followed by Connecticut, with more than 80,000. "That is unacceptable," said New Jersey Gov. Phil Murphy, who added that crews from as far away as Florida, Alabama and Kentucky were heading to the state to help restore power. 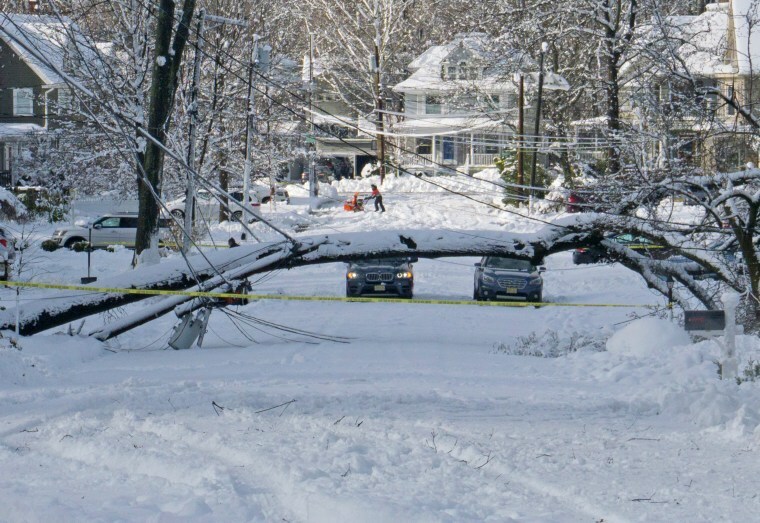 In Stamford, Connecticut, which got 10 inches of snow, Mayor David Martin warned that it could be days before more than 2,800 customers in the city have their power restored. "Unfortunately, Stamford was hit hard by this storm, with many trees and power lines down," he said. Meanwhile, many New York City-bound commuters were feeling powerless. New Jersey Transit, which has had trouble getting commuters to the city on time even when the weather is good, canceled service on its most heavily traveled train lines Thursday morning because of downed trees on the tracks. Frustrated train riders were forced onto crowded buses, and the lines at the stops in communities like Bloomfield and Clifton snaked around street corners. Amtrak, however, resumed service between New York City and Boston, but on a modified schedule. And after about 2,600 departures and arrivals were scrapped Wednesday at airports in Boston, Philadelphia, New York and Newark, New Jersey, the number fell to fewer than 400 on Thursday. The nor'easter on Wednesday brought a wide range of snowfall across the mid-Atlantic and the Northeast, from just a few inches in parts of Delaware and Maryland to more than 2 feet in New York, New Jersey and Massachusetts. Philadelphia International Airport recorded about 6 inches of snow, the National Weather Service reported. Sloatsburg, New York, got 26 inches. New York's Central Park was hit with less than 3 inches, but it fell like like sloppy, wet ticker tape and coated the streets and sidewalks with a thick sludge. Witnesses also reported lightning and peals of thunder across the region — a rare phenomenon called "thundersnow." At its peak, snow fell at a rate of up to 3 inches an hour. The storm hit as coastal towns like Duxbury, Massachusetts, were still recovering from devastating flooding that demolished part of its sea wall during the previous nor'easter. But the town was able to breathe a sigh of relief after the sea wall held up during Thursday morning's high tide. "This morning's high tide did not compromise any of the sea wall nor did it affect the improvised armoring of sections where it had breached. Work continues today on the sea wall," a spokesperson for the Duxbury Fire Department tweeted. In the historic Maine town of Kennebunk, Beach Avenue had been closed since last Friday and was not expected to reopen until this Friday. Eric Labelle, the town's public services director, told New England Cable News that authorities would examine the sea walls, roads and culverts after the storm passes. "There may be some compromised areas," he said. As she surveyed new damage along Beach Avenue, Tami York, a Kennebunk resident, told NECN: "It's just going to add insult to injury." CORRECTION (March 8, 2018, 10:45 p.m. ET): An earlier version of this article misstated where the Bush family's summer home is located. It is in Kennebunkport, Maine, not Kennebunk. Alex Johnson and Erik Ortiz contributed.